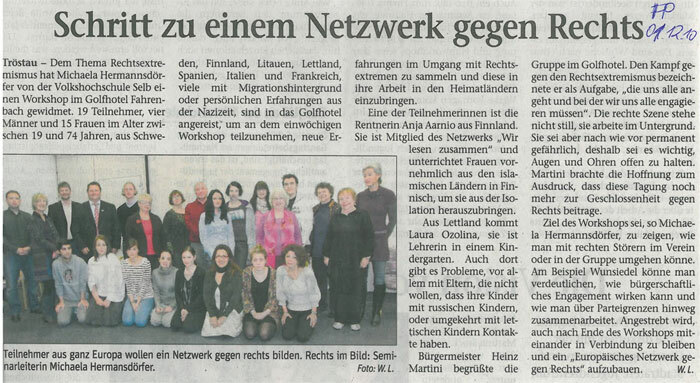 This GRUNDTVIG project is addressed to teachers for seniors as well as to seniors themselves. The European society gets older and older. The amount of older people who are still working increases permanently. At the same time, the requirements on employed persons to adapt to innovations and technological progress grow faster and faster. The gap between professional experience of older citizens and technological know-how of the young generation becomes bigger and bigger. The project based on the knowledge of a previous partnership which tried to make the access to new technologies easier for older citizens. It is aimed on teachers in the adult education with special offers for senior citizens. Target-group-specific training methods and individual support at the studying makes it possible to use existing knowledge profitably. Especially teenagers and young adults should be confirmed in their teaching activities, to improve the networking in technological knowledge and working experience. The task of the project is to support younger teachers in course planning and execution. The development of special training methods is task of the project besides team teaching and observation. It is not a classic student-teacher relation, the main subjects of this education are exchange of knowledge and experience. Target groups of the project are senior citizens just like young teachers. Senior citizens profit from improved teaching methods, teachers can utilize her acquired knowledge also professionally, e.g. for presentations . Besides that, existing knowledge can be utilized by it profitably for enterprises further on. All partners have special offers for seniors, partly as an adult education centre, partly as an institution especially for seniors. All represent various institutions in the field of education. That enables to bring different experience and wide range of ideas and activities into the project so that the tasks of the project can be fulfilled. The project aims can be divided into to 3 parts: Aims for teachers, aims for seniors and aims for institutions. - should be enabled to create specific lessons for seniors with all needs this target group has. That means learning by using all senses, new ways to explain, new examples etc. - are encouraged to make visits in partner organizations to get an impression of different teaching methods. - are enabled to use new technologies, mainly computer. They fulfill the requirements of labor market and can still stay at work. - can use e-mail to get in touch with relatives in other parts of the country or Europe. The project based on the results of a previous project. Seniors are now able to attend special offers in the partner organizations. In the next step they get in touch with seniors in other European partner countries, e.g. by private mails and as participants during the meetings. Teachers for senior courses are able to exchange experience in teaching, they use the possibility for hosting courses in partner countries. Both target groups (seniors and teachers) get a new view of the European idea and the European citizenship. E-Seniors team partcipated to the workshop organized in Selb about ""Right-wing extremism" in your group – How to deal with it"
We staged the SOG 2011 together with E-seniors and Library in Chrzanow (date: 21.VI.2011). 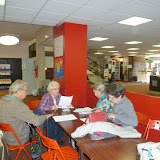 In it took part 17 participants from Poland and 10 from France (in age over 60). We made it in the same time and all had chance to connect via Skype.